On Thursday, the Edmonton Oilers lost their fifth straight game and helped Los Angeles snap their own losing skid as the Kings defeated the Oilers 4-2. An interesting player and unrestricted free agent was watching that game closely. Jarret Stoll was up in the press box and made it known that he was looking for another shot to resurrect his career. The Oilers and Kings are two teams he knows an awful lot about. Stoll was with the Oilers from 2002 to 2008 and in that time racked up 165 points in 286 games. He was a central part of the 2006 Stanley Cup run to which the Oilers fell short by one game. He was a power play specialist, penalty killing regular, faceoff wizard and excellent top-nine player until he started to fall a bit out of favor with then-coach Craig MacTavish. Stoll was traded to the Los Angeles Kings along with Matt Greene for Lubomir Visnovsky. At the time, there was word that Oilers’ GM Kevin Lowe immediately regretted making the move realizing just how much he was potentially giving up. Stoll arrived in Los Angeles and was a consistent 40-plus point player for the Kings for three seasons. It wasn’t until his 2011-12 season that his play came into question as did his ability to keep up with the game. One thing that stayed clear, was that in a more diminished role — one where he would play more limited minutes in areas that he was strongest in — he was still a useful asset. While Stoll came close to winning the Stanley Cup in Edmonton, it wasn’t until he arrived in Los Angeles that he could eventually call himself a two-time winner of the NHL’s biggest prize. The final cup run was the end of Stoll’s tenure as a King and he went on to play for the New York Rangers and Minnesota Wild in more limited roles. Stoll was hoping to make another run at things this past summer as he accepted a professional tryout (PTO) with the Columbus Blue Jackets, only to be released and ultimately not picked up by another NHL franchise. It was a reality check for a player who’d had a number of ups and downs in his career (both on and off the ice) over the past few seasons. He wasn’t, however, completely surprised. While it didn’t pan out for Stoll in Columbus, as long time writer for the Edmonton Journal, Jim Matheson pointed out after the Oilers versus the Kings game on Thursday, Stoll is looking for one more chance and one more month. He wants just a little more time to ensure that all his options are exhausted before looking at a player development role with the Kings. Knowing that Stoll isn’t yet calling it quits and knowing that he has a history with the Oilers — a team he happened to be coincidentally watching — is he the kind of player the Oilers could use? The answer is probably no, but the thought of it is intriguing, to say the least. So too, the back-story is there. Stoll is an unrestricted free agent who would cost Edmonton nothing but the smallest of contracts. He’s a player that has a history with the organization and he offers some skills that Edmonton is lacking during this five-game losing streak. 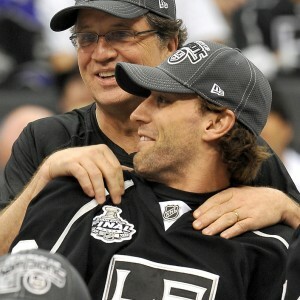 In any other situation, it might be worth having a conversation with Stoll and his agent. All that said, the reality is, just because the Oilers have now lost a number of games in a row, this is not the time to make panic-driven decisions. It’s natural to think that a shot from the point that might improve an 0-12 power play over this losing streak is appealing. It’s also natural to suggest that the Oilers could use a leader who can help teach the young players how to win. Stoll was part of two very successful teams who won it all. These are qualities I’m sure the Oilers wished they had a lot more of on their current roster. Unfortunately, when it comes to playing hockey, Stoll just isn’t a better option than what the Oilers have in their own system. Stoll stayed unsigned after his PTO release for a reason. 29 other teams after Columbus didn’t think he had what it took to be a contributor in the NHL, which is a situation facing a lot of former NHL’ers who had some very decent careers. Stoll was known as a faceoff guy, a talented penalty killer and had a cannon from the point. These are skills that kept him employed. Outside of these skills, he’s not a terribly valuable piece. He’s one of many still available unrestricted free agents looking for work, but still sitting on the sidelines waiting. Unfortunately for Jarret Stoll, he’ll probably stay an on-looker over that month he’s giving it before having to choose what to do with his life after playing hockey.